The Perth Mint is well known for producing some of the most sought-after bullion coins each year, such as its Australian Kookaburra and Australian Koala coins. In recent years, the Lunar Series II coins have established themselves as perennial contenders for the crown of “most-popular coin” from the Perth Mint. Right now, 2017 1 Kilogram Silver Australian Rooster Coins are available from Silver.com. Tenth design in Lunar Series II. Consists of 1 Kilogram, or 32.15 Troy ounces, of .999 fine silver in BU condition. Bears a face value of $30 (AUD) backed by the federal government of Australia. 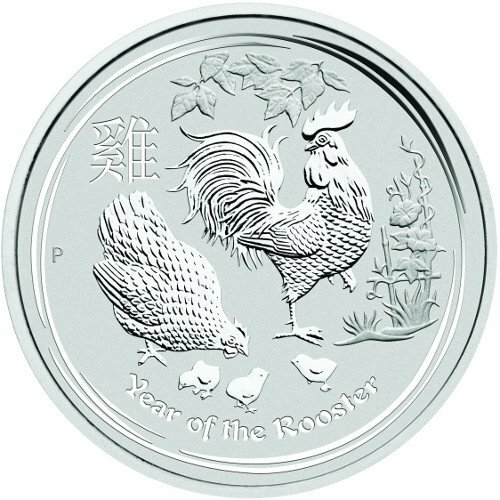 Year of the Rooster design on the reverse. All 2017 1 Kilogram Silver Australian Rooster Coins in this Silver.com listing are Brilliant Uncirculated specimens. Coins in this condition exhibit no signs of wear and tear, though you will notice minor flaws that range from breaks in the luster and spotted surfaces to contact marks from the coining process. Lunar Series II is a 12-coin program that runs in conjunction with the 12-year cycle of the Zodiac. The Chinese Lunar Calendar has an animal assigned to each of the 12 years in the cycle, with 2017 representing the Year of the Rooster. Those born under this sign are said to be loyal, honest, hardworking, and sociable. 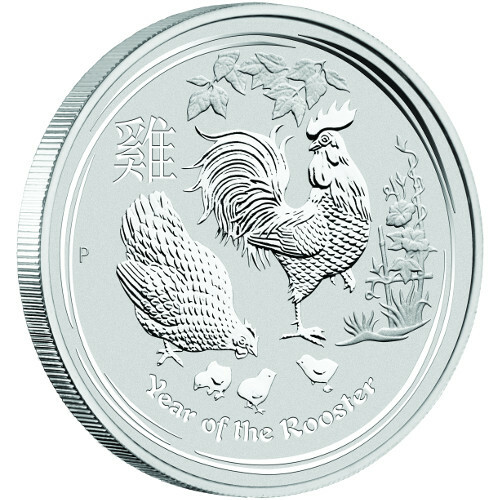 On the reverse of all 2017 1 Kilogram Silver Australian Rooster Coins is the Year of the Rooster design exclusive to the silver coins in this release. It features a rooster as the focal point of the design, along with a hen and three chicks hunting for food on the ground. Primary engravings include the phrase “Year of the Rooster” and the Perth Mint’s “P” mint mark. 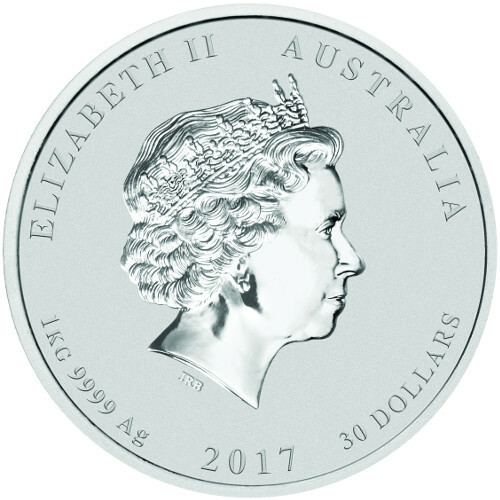 The obverse of each 2017 Silver Australian Rooster Coin includes the familiar right-profile portrait of Queen Elizabeth II. Her Majesty’s effigy has appeared on the obverse of all commonwealth coinage since 1953, with her image occasionally updated to reflect her age. This 1998 depiction is a fourth-generation image of the Queen. Perth Mint is a state-owned entity of the government of Western Australia. The oldest operating mint in the nation, it was originally opened as the third and final Royal Mint facility. Following Australian federation, it was an important mint in the country along with the Melbourne Mint. Today, Australian coinage is struck at the Royal Australian Mint in Canberra. If you have any questions, please don’t hesitate to ask. Silver.com customer service team members are available at 888-989-7223, online through our live chat, and via our email address.